It is said the best golf swing is effortless. 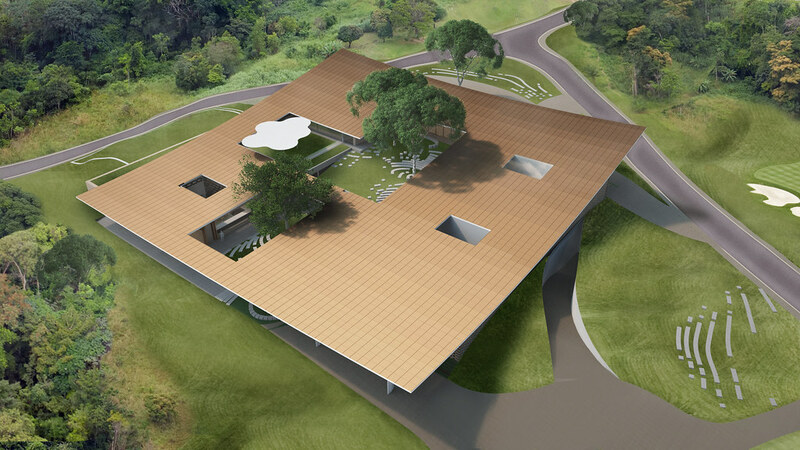 For this Clubhouse in Libreville, the building starts at the top of a hill and effortlessly makes its way down to its final destination, the golf course. Through a series of stepped terraces and a single curved roof that opens to views and gardens, the building is an integral part of the hill. It uses the site’s existing topography to make the transition from one space to the next seamless, and gracefully guides the visitor through. All spaces flow around the central Hill Courtyard which acts as the main landscape and organizational feature in the building. While the Shop is a central pivot point for the program, the true heart of the Clubhouse is this central courtyard space. Surrounded by an abundance of shaded areas, the Hill Courtyard is a captured piece of Gabonese nature, a space that reinforces the sense that within the city as a whole, one is within a garden.